Brigitte Todd - Joseph Smith, died in the Rounds Green Pit Disaster 1846, what happened to his widow? Do you have any suggestions as to how I can find out more about the widow of Joseph? ROUNDS GREEN NEW PIT. Oldbury, Staffordshire. 17th. November, 1846. The pit was in Newberry Lane and the property of Mr. North of Wednesbury. Shortly after twenty five men had descended the pit on a Tuesday morning, a section of the men was found to be filled with firedamp. The mine was worked with naked lights and the subsequent explosion killed nineteen and another was not expected to survive. There were men in the shaft being wound down at the time of the blast. As the flame came up the shaft they were blown 30 feet into the air and two fell down the shaft to their deaths. Mr. North went down the pit and found the two men T. Roden and W. Henshaw at the bottom of the shaft. Smith, Joseph, aged 34 - the doggy or Penitent - His responsibilities included checking for the presence of gas before the colliers entered the pit, and ‘fire’ any gas that was present. The inquest was held at the Talbot Arms, Oldbury when a verdict of ‘Accidental Death’ was returned on accout of the imperfect ventilation of the pit. The accident was made the subject of a special government inquiry. 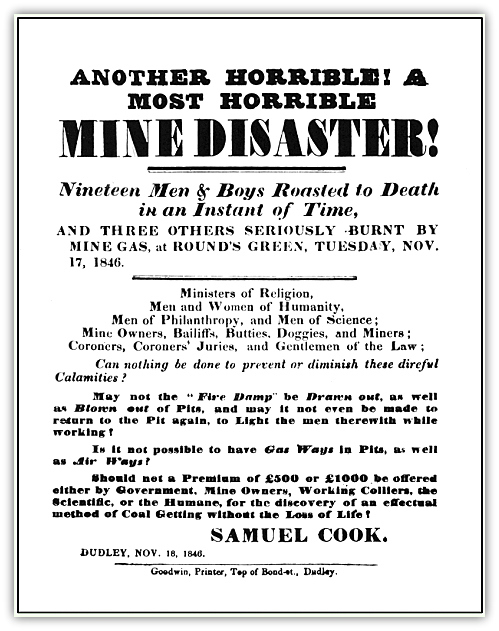 At the Worcester assizes, on Saturday, Thomas Haines, the ground bailiff of Round Green Colliery, near Hales Owen, was indicted for manslaughter, in consequence of the circumstances of an explosion of fire-damp, which occurred in the mine on the 19th November, and which destroyed nineteen persons. The indictment alleged that it was his duty to keep the mine properly ventilated, by causing channels called "air headings" to be made in proper places, which had not been done, although required; for the men were in the habit of dispelling the noxious gases prior to the accident, by shaking their coats among the foul air. Two miners, apprehensive of danger, had left the mine a few weeks previous to the explosion, which took place in what is called a cross of the mine — that is, a chamber worked on an acclivity. The nearest "heading" was fifty yards from the back of the chamber. There was a person employed, called a "doggy," whose duty it was to go first into the mine with a safety lamp, and to report upon the state of any particular portion of it, but he was one of the persons killed on this occasion; there also another person employed, called a "butty," a part of whose duty it was to attend to the proper ventilation of the mine, and in case "air headings" were wanted to consult with the ground bailiff on the subject. There was no proof that this had been done in this instance, Mr. Justice Maule, in summing up, said that the question for the jury to decide was, whether it was the plain and obvious duty of the prisoner to cause the necessary "air headings" to be made; and whether, in omitting to do so, he was guilty of that neglect which would affix to him the crime of manslaughter — the deaths of many individuals having been the result of such neglect. The jury returned a verdict of "not guilty,"